Temperatures in Athens have been hitting the mid 30s for weeks. Today, a fairly strong wind was blowing through Southern Greece. These two combined make ideal conditions for wildfires. Indeed, and unfortunately, at several places around Athens, as well as in the southern Peloponnese, wildfires did appear. 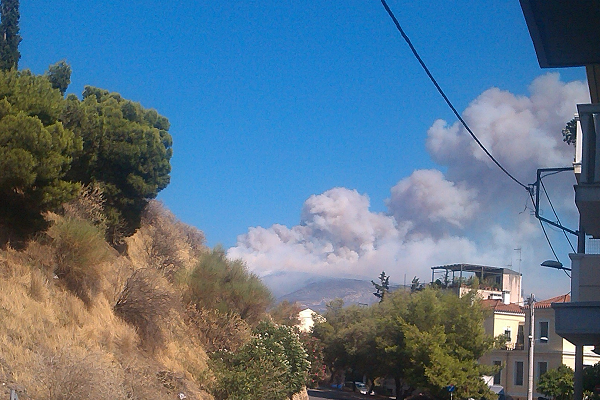 The images of the fires on the hills surrounding Athens looked both impressive and scary when I saw them on the Internet. Even from our house, miles away from those hills, we could see thick clouds of smoke. Two water-dropping planes were constantly taking water from the Saronic Gulf in an attempt to battle the blaze. 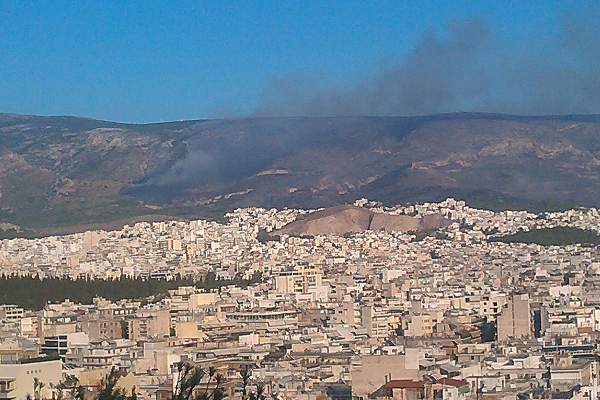 When I got a clearer view of the main fire early in the evening, it did look like they had at least had some success. In the meantime, Greece has been given a little over seven billion euros in bridge financing from our friends in Europe — or, as the Greek government used to call them until recently: terrorists! criminals! Nazis! There’s no reason to get too excited about that just yet as most of this money will be used to pay bills that have arrived in recent weeks, but that the government had wisely left unopened. But more help is on its way, some of which is explicitly meant to kick-start the economy. Banks will open too, but it’s not yet clear whether this will happen on Monday as had initially been announced. Lifting capital controls is much, much harder than imposing them. This entry was posted in Uncategorized on July 17, 2015 by Martijn.